I really, really like baked fruit. I possibly like baked fruit even more than I like fresh fruit. Which is saying something. (Possibly about traumatic raw food experiences as a child, I don’t know.) 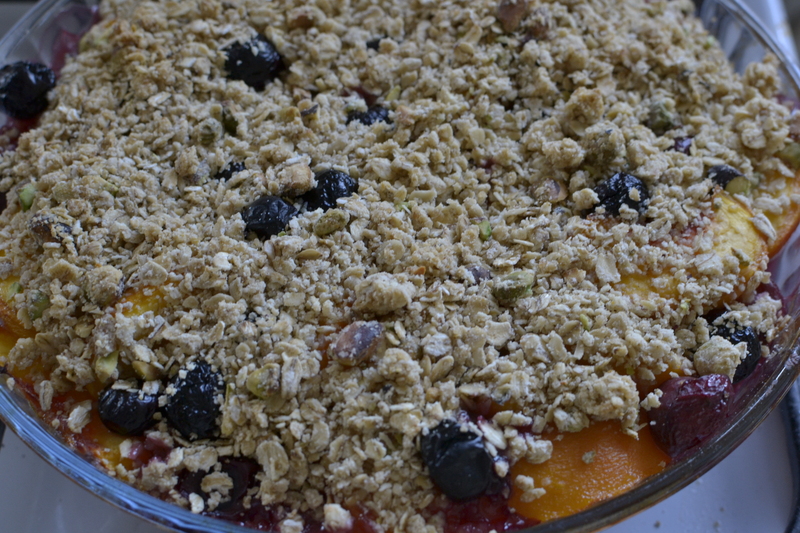 But my preferred way to eat fruit is to have it baked, with an oat topping. I’m predictable and slightly boring, I am aware. This crumble highlights the best of the summer fruits current available at my local fruit and vegetable shop, Fred Hallam in Beeston if you’re wondering, which happen to be peaches, cherries (from Kent) and blueberries. I was invited over to cook (that sounds strange when I write it) for American friends yesterday – they do a Sunday dinner thing – and we ate outside in the garden. There was a vegetarian amongst us so I decided the easiest (and cheapest) was to do an all-vegetarian menu. I made tomato cobbler with blue cheese biscuits (from Joy the Baker, which I will post about separately), a squash and rocket salad and this crumble. There is no recipe for this crumble. I apologise, I just wasn’t organised enough to weigh everything out and I make crumble by sight (I was also ridiculously hungover from a hen night and couldn’t be bothered to stand upright longer than was strictly necessary). But I thought you’d enjoy the photos anyhow. 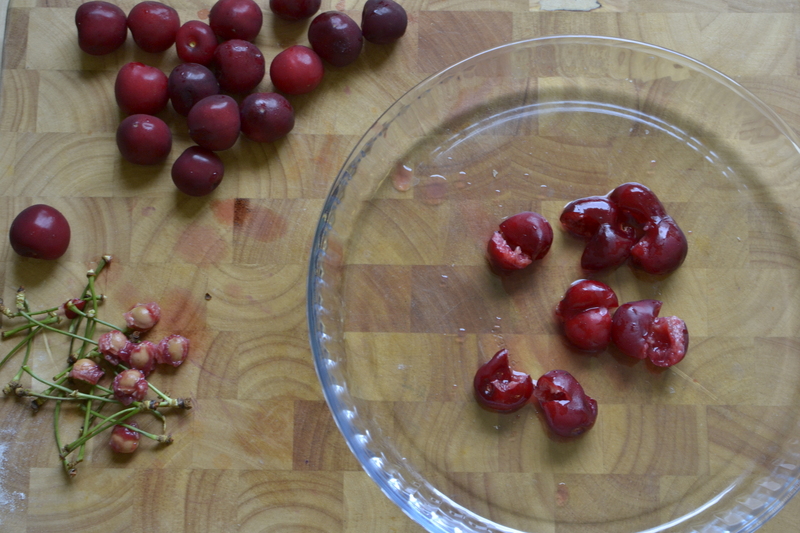 I used four peaches, about 500g cherries and a handful of blueberries. The crumble was made with oats, plain flour, some demerara sugar, a generous handful of chopped pistachios and some butter (about 50g worth). I served it with crème fraîche but you could do cream/ice cream/yoghurt. I had the left-overs today after dinner but it works equally well as breakfast.